And yet they continue to seek style over substance: Programmatic ad spending is projected to grow by 31 percent in 2017—faster than any other channel. Yes, programmatic promises more targeted—and more relevant—advertising. However, the onus is on agencies to determine whether its application provides real value for their clients. The battle isn’t between programmatic and other types of marketing, but between good results and bad. When marketers favor trendy techniques over performance, the bottom line suffers. Digital marketing, like any form of direct response marketing, needs to show a real return on investment, not flash. That’s why a performance-based marketing approach is so critical to ensuring quality outcomes. The term “performance” will never go out of style, as it’s an outcome and not an input. In the past, marketers had less insight into which techniques actually produced certain results. They were forced to work with limited information. As more advertising partners become willing to cooperate based on performance metrics, however, marketers can no longer justify spending money on input-based strategies. Before the advent of digital attribution technology, companies would often double- and even triple-spend on the same customer. Marketers might claim a boost in sales was thanks to a Facebook campaign, SEO, or an affiliate—yet none of them could rightly claim credit for the sale in its entirety. Today, programmatic falls into that same pool. Companies continue to spend millions of dollars on it, yet their metrics often don’t prove programmatic gets any results. Programmatic became so huge in part because of its payment structure. Everyone along the value chain grabs a piece of the pie and is paid on volume. And as long as the advertiser keeps signing the checks, it incentivizes these partners to keep pushing programmatic strategies. Due to backlash and a demand for more measurement, these partners are finally being forced into performance partnership compensation models. These days, marketers’ feet are held to the fire to justify their spending choices. Suboptimal tactics can’t take the heat of metrics-based scrutiny. In fact, according to the 2017 CMO Survey conducted by Deloitte, the American Marketing Association, and Duke University’s Fuqua School of Business, while 42 percent of senior marketers are able to qualify their investments, they are incapable of making quantitative sense of them. As more companies move to direct sales, marketing metrics come into clearer focus. It’s one thing to market a product you aren’t looking to sell—in these cases, brand marketing is the biggest influence. It’s another thing entirely to sell a product directly when your goal is a sale and you have data about the customer journey. By basing strategies on this data (and not the coolest new capabilities exhibited at conferences), marketers can enjoy long-lasting success without the uncertainty of untested techniques. In October of last year, The New York Times acquired gadget and gear review site The Wirecutter for $30 million. I knew its revenue depended heavily on affiliate links, so I asked Jessica Spira, director and head of revenue at The Wirecutter, about the company’s performance-based model. She said that The Wirecutter has built a high level of trust with audiences by putting readers first. Readers seek out the site’s objective reviews once they’re ready to make a purchase, specifically for product and service recommendations. Contextual calls to action help translate that intent into healthy conversion rates. You don’t have to settle for ineffective marketing techniques. Follow these tips to arrange better agreements with partners and achieve better results. People swoon over new things, and the rise of programmatic marketing was no exception. Marketers wanted to talk about it, but not many of them knew exactly what it meant. Most still don’t. They adopted programmatic not because it produced results, but because everyone else was doing it, and their agency was pushing it. I talked to companies all the time that wanted to start programmatic because they saw their competitors doing it. When I asked them if they knew whether it was working or losing the other companies money, they never knew the answer. Don’t let your marketing strategy fall prey to fads. Pay attention to and test the latest trends—Snapchat filters, Facebook Messenger bots, Pokémon GO localization, what have you—but rely on your existing success metrics and objectives to guide you. If you’re always chasing the next big thing and suspending your definition of success, you’ll blow your budget before you know it. When we work with clients on events, for example, they often don’t know how to measure their success. What separates a spectacular event from a waste of money? Do they want more people at the booth, more conversations, or more follow-ups? Be specific when executing a new strategy: How will you quantify success? Set hard numbers you want to achieve—such as two leads within one week—and measure your performance against those goals over time. The clearer you are about your intentions from the outset, the more likely you are to achieve your goals or know whether the tactic is going to work. Trying new things separates successful, leading companies from those that follow in their footsteps. Sometimes measurement makes you more risk-averse. Leverage your research and development budget to experiment. Test the outcomes against your goals and expectations, knowing that some of them won’t work—and that’s fine. When evaluating results from new techniques and channels, exercise caution when projecting your numbers for the future. A few users today might not provide significant ROI. A year from now, however, you could benefit from an established presence on a growing platform. On the other side, if you see great results from a new venture immediately, don’t assume you will be able to maintain those metrics. Most digital marketing is now sold in an auction format. This causes costs to rise and ROI to plummet as more and more people move into a channel. As you experiment, use your data to add personalization to your approach. According to Forrester, high-maturity marketers use data management platforms at a rate 32 percent higher than low-maturity ones. By leveraging cost per action, marketers can identify desired behaviors (such as leads or sales from specific channels), track them, and compensate partners in real time. It’s win-win. Without this connection, however, unscrupulous partners can take advantage of the system. As we have seen, ad fraud in programmatic marketing is rampant. Partners use bots to drive artificial traffic, fooling marketers into paying for illegitimate actions that produce no monetary value. I’ve spoken to many high-level marketers who had no idea they could prevent this via tracking and attributing value by shifting to CPA models. What constitutes a good outcome depends on the individual marketer. However, a performance model is the best way to make sure that everyone’s incentives are aligned—and performance never goes out of style. 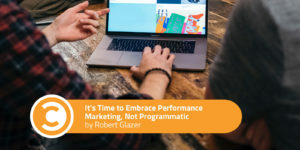 With so much more information available on performance today, marketers cannot responsibly rely on one technique based on appeal alone. It’s not about where you spend money, but about where your money is doing the most work for you. Digital marketers must refocus on performance and cast aside distractions to eliminate wasteful spending and increase ROI. Robert Glazer is the founder and managing director of Acceleration Partners, the author of the best-selling book Performance Partnerships: The Checkered Past, Shifting Present, and Exciting Future of Affiliate Marketing, and a sought-after keynote speaker. Book Robert to speak at your next event here.